Discovering something new is possibly the most exciting thing a field biologist can do. As students, budding biologists imagine coming across something no one else has ever noticed before, maybe even getting the opportunity to name a new bird, fish, or plant after themselves. Well, here in Pensacola, we are discovering something that, while already named and common in other places, is extraordinarily rare for us. What we have found are red mangroves. Mangroves are small to medium-sized trees that grow in brackish coastal marshes. There are three common kinds of mangroves, black (Avicennia germinans), white (Laguncularia racemosa), and red (Rhizophora mangle). Black mangroves are typically the northernmost dwelling species, as they can tolerate occasional freezes. They have maintained a large population in south Louisiana’s Chandeleur Islands for many years. White and red mangroves, however, typically thrive in climates that are warmer year-round—think of a latitude near Cedar Key and south. 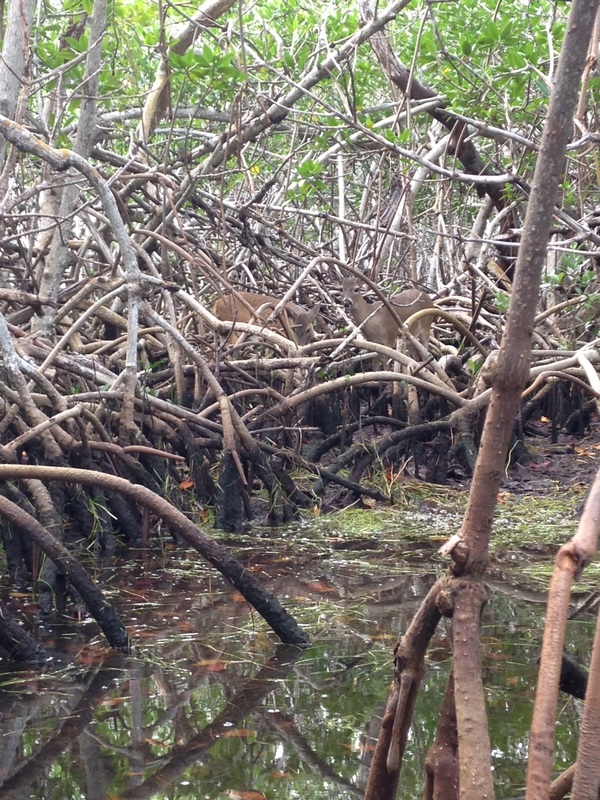 The unique prop roots of a red mangrove (often called a “walking tree”) jut out of the water, forming a thick mat of difficult-to-walk-through habitat for coastal fish, birds, and mammals. In tropical and semi-tropical locations, they form a highly productive ecosystem for estuarine fish and invertebrates, including sea urchins, oysters, mangrove and mud crabs, snapper, snook, and shrimp. Interestingly, botanists and ecologists have been observing an expansion in range for all mangroves in the past few years. A study published 3 years ago (Cavanaugh, 2014) documented mangroves moving north along a stretch of coastline near St. Augustine. There, the mangrove population doubled between 1984-2011. The working theory behind this expansion (observed worldwide) is not necessarily warming average temperatures, but fewer hard freezes in the winter. The handful of red mangroves we have identified in the Perdido Key area have been living among the needlerush and cordgrass-dominated salt marsh quite happily for at least a full year. 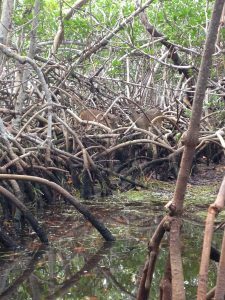 Two researchers from Dauphin Island Sea Lab are planning to expand a study published in 2014 to determine the extent of mangrove expansion in the northern Gulf Coast. After observing black mangroves growing on barrier islands in Mississippi and Alabama, we are working with them to start a citizen science initiative that may help locate more mangroves in the Florida panhandle. So what does all of this mean? Are mangroves taking over our salt marshes? Where did they come from? Are they going to outcompete our salt marshes by shading them out, as they have elsewhere? Will this change the food web within the marshes? Will we start getting roseate spoonbills and frigate birds nesting in north Florida? Is this a fluke due to a single warm winter, and they will die off when we get a freeze below 25° F in January? These are the questions we, and our fellow ecologists, will be asking and researching. 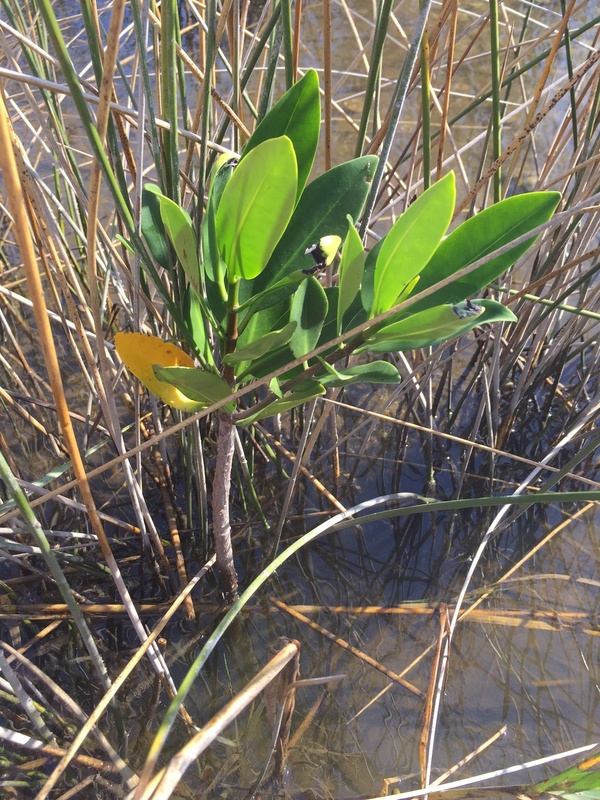 What we do know is that red mangrove propagules (seed pods) have been floating up to north Florida for many years, but never had the right conditions to take root and thrive. 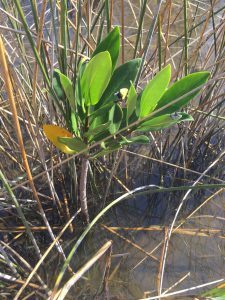 Mangroves are native, beneficial plants that stabilize and protect coastlines from storms and erosion and provide valuable food and habitat for wildlife. Only time will tell if they will become commonplace in our area. If you are curious about mangroves or interested in volunteering as an observer for the upcoming study, please contact me at ctsteven@ufl.edu. We enjoy hearing from our readers.